Last Friday, the bosses at TheMMQB assigned me to write a Deep Dive about how the Seahawks were using Jimmy Graham, who had just seven catches for 62 yards through the first two weeks of the season. I spent the better part of the next 48 hours thinking not about what I would write, but rather, how I would write them an e-mail explaining why the Graham piece would have barely 200 words. Further complicating matters, one of the editors said it’d be great to have graphics to go along with the Graham piece. Graphics of what exactly? After watching Seattle’s film from Weeks 1 and 2, there was absolutely nothing to say about Jimmy Graham. The Seahawks hadn’t done anything special to get him involved. His paltry numbers were an accurate reflection of his film. The only news surrounding Graham was that he was frustrated; it would have been more newsworthy if he weren’t. • BENOIT’S EXTRA POINT: The Eagles picked up a W, but one major question remains unanswered: What do they have in Sam Bradford? Fortunately, the equation changed in the Seahawks’ Week 3 thumping of the Bears. 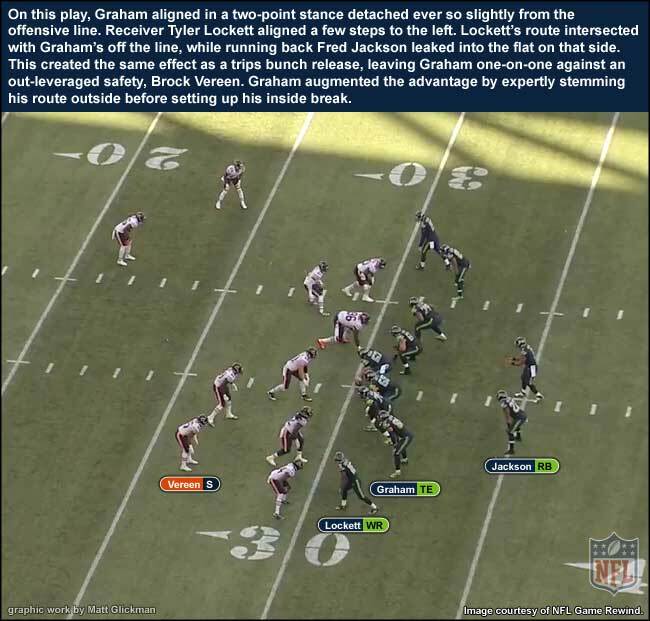 Russell Wilson and offensive coordinator Darrell Bevell went out of their way to include their new tight end, throwing Graham a simple, rhythm-establishing pass in the flats on the first play. He was targeted seven more times and finished with seven catches for 83 yards and a touchdown. That touchdown—a 30-yarder in the third quarter—was another play designed specifically for him. While last Sunday was a good start for Graham and the Seahawks, it was by no means a final sampling of what the 28-year-old can be in this offense. Every play for Graham, save for a three-yard fade that was unsuccessful against cornerback Alan Ball in the end zone, was the type of play that could be drawn up for any respectable pass-catching tight end. The Seahawks, of course, did not trade a first-round pick along with Pro Bowl center Max Unger and dedicate an average $9 million in annual cap space to acquire a “respectable” tight end. Graham’s value is that he’s a matchup nightmare for a defense. And he can dictate the contents of those nightmares simply by where he lines up. For most of the Bears game, Graham aligned in a variation of the standard “line of scrimmage tight end” position. 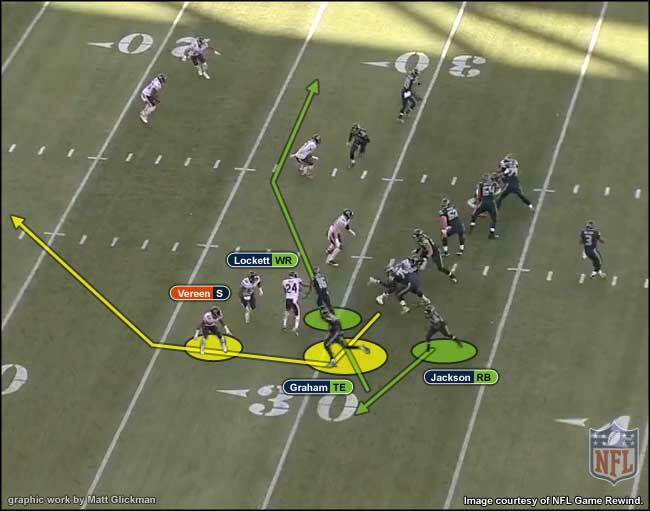 To maximize Graham’s value, the Seahawks must detach him from the formation, either in the slot or as a receiver split wide. Doing this forces the defense to respond to Graham. And because he’s a tight end, this response almost always tells the quarterback before the snap whether the coverage is man or zone. If a linebacker or safety follows Graham outside, it’s man-to-man. If a cornerback stays on him out there, rather than following a wide receiver to somewhere else in the formation, it’s zone. Linebackers and safeties (and even some corners) have trouble against Graham’s size and athleticism when going one-on-one in space. The Seahawks have no receivers worth double-teaming outside. 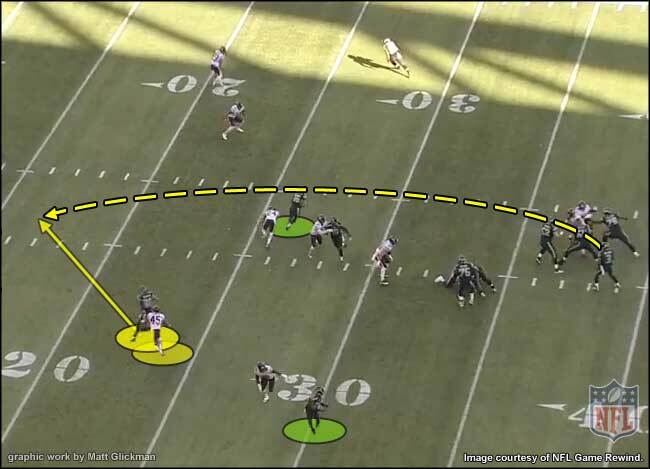 Graham can change this, which would make coverages more predictable for Wilson to dissect. There are limited ways to double-team an outside target, and almost all of them create some form of single coverage for targets near the seams or field numbers. That’s where guys such as Doug Baldwin and Jermaine Kearse can prosper. When split out, Graham’s defender is also likely to be uncomfortable; cornerbacks are unaccustomed to facing a man his size and linebackers or safeties don’t often cover on an island in that part of the field. What may give the Seahawks pause in making Graham a more versatile chess piece is if Wilson is uncomfortable with a revamped equation. Wilson is different from other quarterbacks in that he loves to play out of structure and, paradoxically, can even do so by design. It’s possible he prefers to garner more traditional defensive looks in order to aid his nature for extending plays. This feels like a reach, but it’s worth considering. Either way, it circles back to one of the most critical and overlooked issues at hand: Graham’s ability to make something happen when plays break down. Much of Wilson’s greatest damage has come in these scenarios. Graham, with his athleticism and basketball background, would seemingly be a superb outlet late in the down as chaos sets in. But Graham also spent the first five years of his career playing in New Orleans, with perhaps the most structured offense in all of football. So as much as the Seahawks must adjust to their new star tight end, their new star tight end must also adjust to them.